Bed and Breakfast in Victoria B.C. "Street View - Victoria, B.C." The Carriage House B&B offers cozy, affordable bed-and-breakfast accommodation in a Victorian era home located in a quiet residential neighbourhood just TWO BLOCKS from Downtown Victoria, B.C., close to museums, the Inner Harbour, and the British Columbia Parliament Buildings; one block to beautiful Beacon Hill Park, three blocks to the Victoria Conference Centre. Wireless internet; free on-site parking. You do not need a car to come to Victoria and stay at the Carriage House Bed & Breakfast. You will find us very conveniently located and an easy walk to many attractions (see map below). The Butchart Gardens attraction is easily reached on the transit system bus line (fare: $2.50). Give your car—and your wallet—a rest! 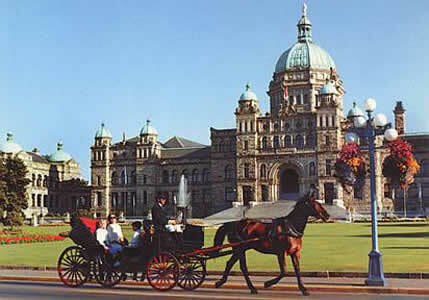 Handy Links for Visitors to Victoria, B.C. What is a B&B, Anyway?